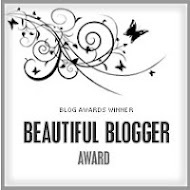 Fifteen-year-old Camilla Dickinson has led a sheltered life with her architect father and stunningly beautiful mother. But suddenly, the security she's always known vanishes as her parents' marriage begins to crumble-and Camilla is caught in the middle. Then she meets Frank, her best friend's brother, and he's someone she can really talk to about life, death, God, and her dream of becoming an astronomer. As Camilla and Frank roam the streets of New York City together, lost in conversation, and he introduces her to people who are so different from anyone she has met before, he opens her eyes to worlds beyond her own, almost as if he were a telescope helping her to see the stars. But sill Camilla's first love be all she hopes, or will Frank just add more heartbreak to her life? I love Madeleine L’Engle. My first encounter of her was with A Wrinkle in Time during my early teens. It had been a wonderful journey reading that book. 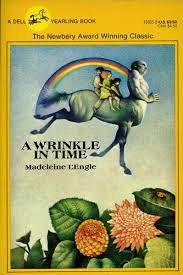 I have also read the other books in the Time Quintet (except for An Acceptable Time) after that but A Wrinkle in Time has been the most memorable on being the first book I have read of Madeleine L’Engle. A few months ago, I was looking through some remnants of a book sale hoping I’d still find a treasure despite the obvious mess that a lot of people had already gotten their hands on the good ones. 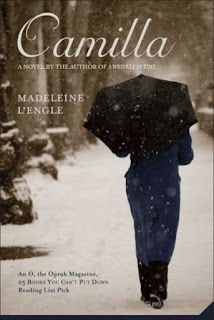 There weren’t too many books left so I didn’t expect to see anything but then I saw her name - Madeleine L’Engle. The cover read, Camilla and the picture was black and white and looked boring for me quite frankly speaking, but the fact that she wrote the book, I knew it was going to be a treasure. There was no need for me to see the inscriptions saying “A novel of the author of A Wrinkle in Time” and “25 Books You Can’t Put Down." Camilla's story has a serious tone, which got too serious for me in some parts of the story. I don’t mind it when authors actually interject their personal beliefs in their writings to get across to their audience and somehow, maybe influence them. But there were some conversations in the book that made it too obvious. Overall though, it was okay for me. It wasn’t as repulsive as I felt when reading The Shack by William P. Young. I enjoyed reading the book because the setting and dilemma of the story were very relatable. I even felt a little connection with Camilla’s character. She is a girl of very few words but she tends to overthink things. In saying that, I thought she was a little overdid in character so was her friend Frank. For 15 and 17 years of age, their conversation and ideas were quite unsuitable. Even her recollection of memories were a bit unrealistic like the part where her friend Luisa was asking her when she first became aware of her or her parents’ individuality. I don’t think a lot of people would have a detailed answer to that, much less Camilla, who has had a very sheltered life. One reason I couldn't put down the book was the romance between Camilla and Frank. It was innocent and so old school but not to the point of making you cringe – except the profound conversations though as mentioned above. Every time Camilla and Frank would meet, I was reminded of my own experiences with my puppy love, who is now my husband (although we weren’t really puppies in terms of age when we met), and it’s such a wonderful and peaceful feeling. The other part that I couldn’t wait to find out was how her mom and dad would deal with their crumbling marriage. Overall, it was a great ride from start to finish although I felt a little bit unbelieving when I reached the last page because it had been ended so abruptly. It felt as if the story ran out of options to continue so it was just ended right there and then. Nevertheless, I found out afterwards that there was actually a sequel to this book which probably explains why. I felt Camilla/and the whole story wasn't very good to Luisa.